Bari Life’s Protein Hot Chocolate Variety Box allows you to sample all of the gourmet hot chocolate flavors we have to offer. All of our decadent hot protein drinks are 80-90 calories and have 14g-15g of protein! Not to mention 1 gram of fat or less! Why drink other hot chocolate brands like Swiss Miss, that lack protein, when you can drink this!? Our hot chocolates are wonderful in a mug of their own, but they also make a great addition to your morning coffee for a healthy start to your day and give you that extra boost of protein! View the individual flavors for nutritional information and ingredients. 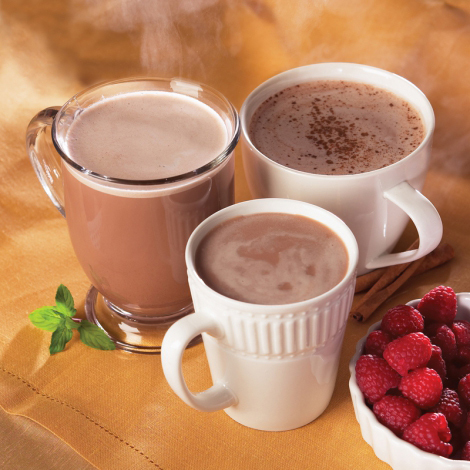 Make the hot chocolate even tastier by using reduced calorie almond milk or skim milk! Reduced calorie almond milk adds only about 30 additional calories and makes it extra rich and creamy tasting! Enjoy cold with ice! Add this to your morning coffee for a healthy start to your day! LOVE this product!! Its like dessert as a meal. The Amaretto is my favorite flavor!! L O V E this product I am almost 7 yrs out. I still use this product every morning. I wish I had know about this product when I went into the hospital fir my surgery. It would have saved a 1st rough 3 months. It is thin and wRm not thick and has 15gm of protein. This has been a life saver. I wanted to be able to try the different flavors, so this variety was just the thing. I haven’t tried them all yet, but just had to share about the raspberry hot cocoa. It was wonderful!! The chocolate was so good, and the raspberry sent it over the top. This one definitely is a winner!! Great way to test out flavors and find your favorite. I liked them all, some more then others. Very good and a good deal!